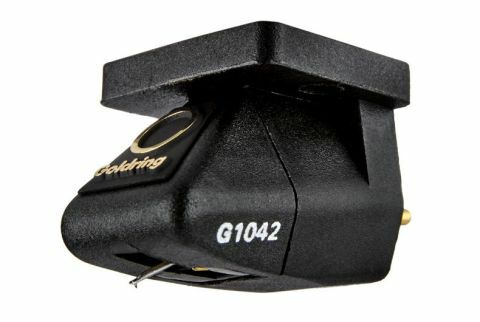 Goldring 1042 review | What Hi-Fi? Goldring is Britain’s oldest cartridge company. It used to make turntables as well back in the vinyl heyday, so it’s safe to assume its bods know a thing or two about playing records. Goldring also makes OEM cartridges for other well-known companies, and offers repair and refurbishment services few can match. Given the vulnerability of these things this is quite reassuring, especially if you have a fixed-stylus MC. The 1042 is not a new model. It has been in the range since the ’90s, when it replaced the 1040 (which looked pretty much identical). It is top dog in Goldring’s moving magnet range but it has to be said it’s not the sexiest-looking cartridge on the block. On the plus side, its black body is made of Pocan, a glass-reinforced plastic material that’s high in rigidity. The longevity of the design would suggest its appeal is not limited to aesthetics. With its removable stylus, you could mistake this Goldring for something a quarter of its price - but the existence of a Gyger S stylus marks it out as a potential wolf in sheep’s attire. The Gyger S is a line-contact stylus. That is to say it’s longer in the direction of the groove than it is wide, which is supposed to let it ‘read’ more of the information in the groove wall. The Goldring proves to be a challenge to fit. Not only does it not have threaded inserts, but the mounting holes are above the cartridge body - so you can’t hold the bolt in place with a hex key or screwdriver. The body does at least have parallel sides, which makes alignment a bit easier. And, of course, you only have to do it once. The 1042 makes up for the fiddly fitting the moment its stylus hits the groove. It has superb detail resolution - you can hear so far into the recording, it’s inspiring. Listening to Jacqueline du Pré you can hear all the texture and gutty woodiness of her cello. The real joy here is how this cartridge brings out the depth of a recording. It achieves this partly by virtue of eliminating noise, or at least not picking so much of it up. The backgrounds are remarkably quiet, which means music has lots of contrast and really produces a believable image in the room. In truth it reveals just why vinyl has come back so strongly. You will be hard-pressed to find a CD player or streamer that has the musical power this Goldring does when on a decent turntable. With Esperanza Spalding’s Judas the sound is more agile, better timed and more articulate than we expect at this price. The tonal balance is convincing but it’s the timing, and sense of light and shade, that make the music dramatically more involving than most rivals manage. Delving into some of the trickier depths of the Captain Beefheart canon, we discover some tracking issues that require a little bit of tracking force adjustment to overcome. This involves us weighting things a little over the recommended 1.75g (we settle on 1.85g in the end) but from then on, the Goldring reveals the intensity of the music without the thinness that often accompanies it. There’s plenty of punch in its detailed, taut and engrossing rendition of this music. The Goldring 1042 is a very good cartridge indeed, and makes the most of any recording. It’s a little fiddly to install but well worth the effort if great musical entertainment is your goal.